I love cooking with chocolate, playing with chocolate, and making candy with chocolate. Dark chocolate, down and dirty. There’s something about melting chocolate, concocting it with delightful tasting infusions and biting into that final prize of time spent in the kitchen. Time spent playing. You know, we’re not making mud pies or dandelion soup anymore… and I’ve long since put my Easy Bake Oven to rest, but if its all the same, I’d still like to consider chocolate my play time. Making truffles used to scare me. I guess a lot of things used to scare me when it came to cooking and creating new things on a whim in the kitchen. Hot & Gooey Cinnamon Toast Sandwiches got me over that a little bit, and ever since then I’ve been coming up with all sorts of wonderful creations. It’s not just what you know, it’s what you’re willing to try. With chocolates, there are some flavors you are just going to love. Then again, there are some you won’t. Dark Chocolate Almond Truffles are SO good in my humble opinion, and my son’s. But my daughter… she’d prefer one of my other chocolate creations. And that’s fine. She’s never been an almond extract fan. These same truffles would be AMAZING with any number of baking extracts or liquors… I’m thinking raspberry, mint, coffee, or even orange. All of those would be delicious flavors to meld with the dark chocolate ganache truffle filling. These Dark Chocolate Almond Truffles have a soft center and are covered in dark chocolate and then decorated with white chocolate. They would make a perfect holiday gift, teacher’s gift, or a just because I’m thinking of you gift to make someone’s day brighter with chocolate. Heat heavy whipping cream over medium heat, stirring often, until it comes to a boil. Turn down the heat and stir in 1 cup dark chocolate chips and extract. Continue stirring until mixture thickens. Put in bowl to refrigerator for 2-3 hours or overnight. Remove bowl from refrigerator and form teaspoon-tablespoon size balls out of chocolate cream by rolling the balls in hands. Lay individual balls on baking sheet lined with parchment paper. 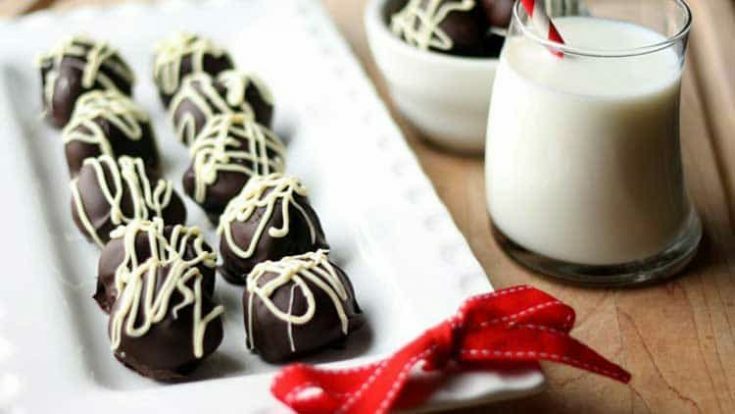 Place baking sheet with chocolate balls in freezer for a few hours or over night. Melt 2 cups dark chocolate chips. Dip frozen chocolate balls into melted chocolate and coat. Return to parchment paper. Dark chocolate will harden quickly. Melt white chocolate and either drizzle with a spoon or use a squeeze bottle. Let chocolates sit to harden, or place in the refrigerator to speed up the process. Wow, these look lush. I love almonds almost as much as I love chocolate… am craving these after reading this. Everything looks so LUSH! I love chocolates and last night bought some for baking. I don’t know if I have all the recipe but if I do I will definitely try this today!!!! Oh man these look amazing! Of course all you had to do was mention dark chocolate and I was hooked! Hi Jessica – wow, these truffles look simply amazing! Thank you so much for sharing them at Best of the Weekend and will be pinning! Hope you have a happy Saturday and a fabulous weekend!